The third gel pack is in a lunch pail right now. The Elbow Freezie Wrap is one of three products I bought to help overcome a tennis elbow injury in 2011. It was the Freezie Wrap and not the Inferno Wrap which helped most in recovering from tennis elbow. A Freezie Wrap can be bought for the leg/knee, shoulder, knee, plantar/spur, wrist, and the elbow which I bought. Tennis elbow injuries take time to heal because the arm is constantly in motion. What the area around the elbow needs when its agitated is ice, not heat. I made the mistake of applying heat in the beginning with the Inferno Wrap when I should have been using the Freezie Wrap. The elbow was inflamed, it needed ice. The Elbow Freezie Wrap is quite simple. Keep all three gel inserts in the freezer at all times. When you need to ice your elbow you put one of the frozen inserts into the built in pouch of the Freezie Wrap. Put your arm into the wrap and tighten it with the velcro. 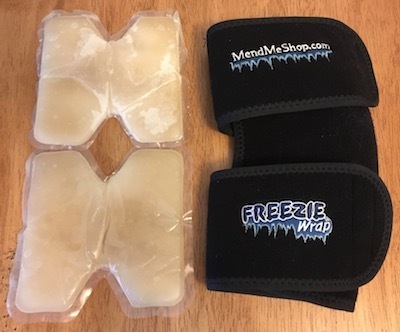 MendMeShop.com calls it their Cold Cure Technology. Frozen gel inserts will keep cold enough to provide relief for 25 minutes. Sometimes I forget I have it on as the compression keeps the pain away too. Most times I forget to take it off and its not until the gel pack is warm when I do so. Versatility is a feature of the Elbow Freezie Wrap I did not expect. Not only does it do a great job of taking care of elbows it also can take care of a knee. I hyperextended my knee during our last week of softball this year. Was a weird play where I was tagged under my knee causing my leg to straighten out while trying to cross home plate. Since I was in the air when I was tagged all of my weight came down on the one leg when I planted my foot. It hurt instantly. Thankfully nothing popped but I was in pain. Not enough pain to stop playing (was Championship night) but I knew the second I sat down, the swelling would kick in. When I made it home that night my knee was swollen. I brought out the Freezie Wrap and was hoping I could wrap my knee in it the same way I do my elbow. Figured the elbow and knee both work like hinges and at the very least was worth a try. It worked. I was able to wrap it just right with the frozen gel pad to cover most of my knee. Went through two frozen ice gel packs that night and two more in the morning. It helped a lot in reducing the swelling in my knee. Frozen gel pack in pouch. Time to wrap. 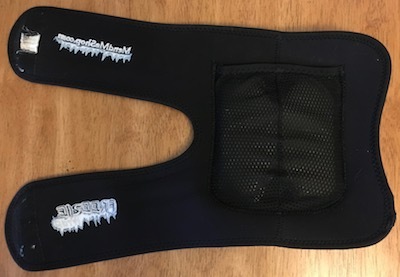 After six years of owning the Elbow Freezie Wrap I would recommend it the most in helping to heal a tennis elbow or knee injury as it can be used for both. As long as I am playing sports, working out, and typing, the tennis elbow will never completely go away. When it starts to act up I throw on the Elbow Freezie Wrap. A half an hour later the pain is gone. It is not a cure-all product but a complimentary one to the Inferno Wrap. Use the Inferno Wrap when the elbow is not hurting to get more blood flowing to heal. Use the Freezie Wrap when its inflamed. Purchase directly from MendMeShop.com like I did or buy it from the MendMeShop Amazon Store. A waiting list is common for the Elbow Freezie Wrap as they sell out quickly. Sometimes there might be none in stock for months. At $60 the Freezie Wrap is not cheap. I feel it is worth it as how many times have you put ice packs on and it only touches the surface of the injury. Oh, and you have to hold a freezing ice pack. This wrap covers the entire elbow in a comfortable set up. MendMeShop.com is located in Canada. Fraudulent activity alerts may happen from your credit card company due to it being processed in Canada. This is what happened to me. Allowed the payment to proceed and received the items in less than a week. A full refund will be issued for returns but you are responsible for shipping it back. Keeping everything is the best mindset to have upon ordering as the shipping can get pricey.